Counterfeiting is a bigger problem than we can ever imagine and counterfeiting in the industries that directly affect people’s health, is a crime. Pharmaceuticals Industry is one such industry which is adversely affected by counterfeiting. The Internet is swamped with the news related to counterfeit drug seizures these days. Fake drugs have become a threat to the society. A person with minor health issues may end up facing dire consequences after consuming a fake drug. Counterfeit drugs could contain incorrect doses, wrong ingredients or no active ingredients at all. Many people can get better with the right medication, but they happen to be consuming fake medicines. And their health keeps on deteriorating further. The irony is that the counterfeiters usually work in such a way that it is difficult to reach the main culprit. Counterfeiting in this industry can only be prevented by securing the supply chain with the help of Track & Trace system and deploying strong Anti-Counterfeit measures. 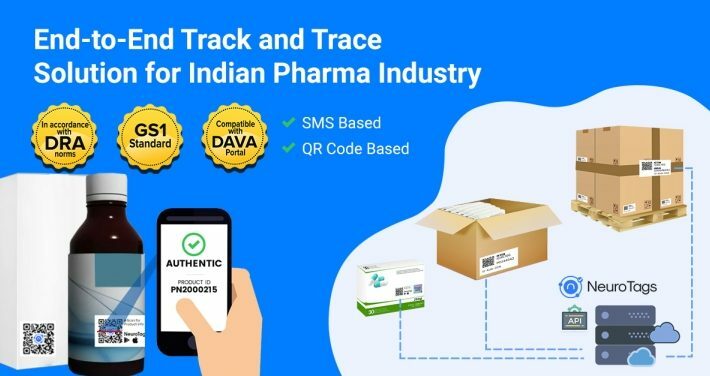 From November 2018, it would be necessary for the Indian Pharmaceutical companies to have Track & Trace and authentication mechanism in place and upload the data of the drugs on DAVA portal in order to export them to other countries. NeuroTags provides end-to-end Track & Trace and Anti-Counterfeit solution for the Indian pharmaceutical companies. The solution is compliant with the DAVA portal, supports the GS1 standard, and also includes drug authentication system. NeuroTags solution is very flexible and can be customized as per the client needs. NeuroTags API can be easily integrated with the company’s current labeling solution. The end-to-end solution also includes assistance in integrating the tagging solution on the current packaging line. 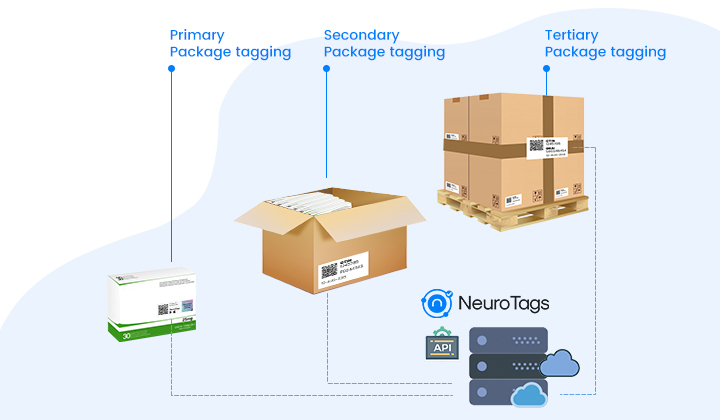 NeuroTags API generates unique tags for each packaging level (primary, secondary and tertiary). The tag format supports the GS1 standard and contains all the information as per the government norms. Neurotags solution also generates ready-to-upload DAVA portal format files in the single click. The primary packaging also contains a protected(hidden) code, that can be a scratchable code on the package or can be kept inside the sealed pack. There are two ways to authenticate the drug – by sending the code by SMS, or by scanning the tag using any smartphone. Buyer sends the open/protected code to the number specified along with the code. NeuroTags server authenticates the drug code and sends back the authenticity information as SMS. The solution is completely customizable as per the client needs. Buyer scans the protected code using any barcode/QR code scanner app on a smartphone. NeuroTags server authenticates the drug code and the buyer can see the authenticity information on the phone screen. NeuroTags also provides white-labeled mobile app if the client needs.